I blame my fire bug on my mother, who has pyromaniac tendencies. She's an Aries, and I am told they love fire. I think it was cultivated by a desire to rid paddocks of mallee roots and cleanse the harsh surroundings of her farm life. She can't wait for the summer fire ban to be lifted and throw a match into the piles of debris she has gathered over the hot months. Like tending to a baby, she will visit the fire through the night, stoking the coals, raking the cinders and pushing in escapees. A warm glow on her satisfied face. I was very proud when I got my "firemaker's badge" as an over achieving Girl Guide, and still challenge myself to light every fire with a single match. Really, I should be rubbing sticks together, seeing as I have plenty of time. 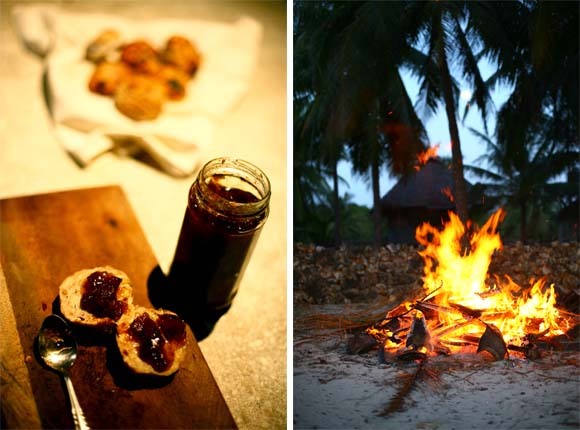 Coconut fronds are a joy to burn - hot, fast, bright - dying down to a bed of fine coals. And so it was this night I was overcome with the desire to make damper. Tom had gone to bed, and I giggled with anticipation as I leafed through the trusty CWA cookbook checking that indeed the ingredients are only flour and water. A.k.a. glorified glue. Thought I'd get fancy and add walnuts and dates, then rolled the dough into small buns, wrapped them in foil and carried them to the fire on the head of a shovel. Twenty minutes later I was selfishly devouring hot damper with fig jam and bits of ash. The following morning, you could have used them as ammunition in your ging to kill a nearby goat. i like your fire bug story!